Do you have an application form that you'd like to name "registration" instead of "application"? Maybe because you offer short courses – like executive courses – available on a pay-per-entry basis, where applicants just have to fill out a simple form? Or because you'd like to request of applicants that once they're accepted into a programme they complete an enrolment form of sorts to formalise the admission? What’s the difference between a registration and an application? 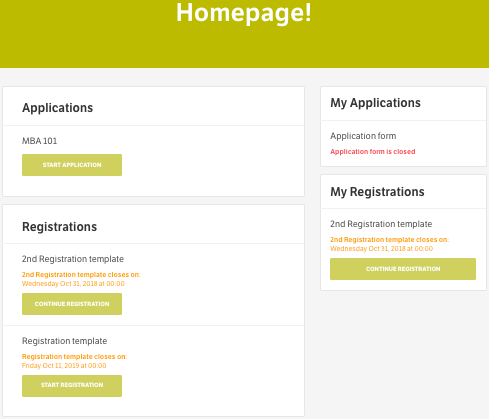 How do I create a registration template? Enable the Registration label to inform the system that this is specifically a registration template and should be treated as such (chiefly to get into the right widgets). You mustn't skip this setting because Application is default. TIP: In keeping with the way FULL FABRIC is built, all institution-level templates are indiscriminately grouped under Application templates in General settings. A best practice tip would be to name your application and registration templates carefully in a way that easily tells them apart. How can I display registration forms on the portal? With the knowledge that you can create registration templates and the how-to, naturally you also need a way to actually make them available to prospects and applicants. In view of this, we created two brand new widgets to be added to the pages of your portal: Registrations and My Registrations. LAST UPDATED: October 17, 2018 at 5:36 p.m.